Commentary: Cloudera was the first ‘unicorn’ — a startup valued at $1 billion or more — that went public at significantly less than its earlier private valuation. Most likely it won’t be the last, and it’s time for the startup world to reckon with the damage done to these fallen unicorns. However unknown Cloudera is to the public, the software company that helps corporations wrangle their digital data achieved an ignominious Silicon Valley milestone. It was the first “unicorn” — a tech startup valued at $1 billion or more — that went public at a valuation significantly below its worth as a private company. Cloudera most likely won’t be the last, and it’s time for the startup world to reckon with the damage done to these fallen unicorns. Three years ago, Intel bought shares in Cloudera that valued it at $4.1 billion. 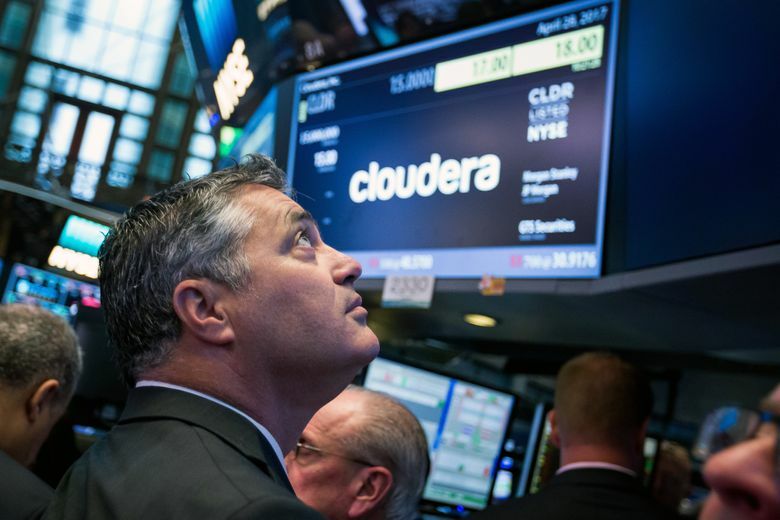 In its initial public offering last week, Cloudera was valued at $1.9 billion, or $2.6 billion including the value of equity held by employees and others. Ouch. It has become fairly common in the last couple of years for tech companies to go public at valuations below where they stood as private companies. (One of Cloudera’s competitors, Hortonworks, also took a valuation haircut at its IPO.) But the scale of the comedown for Cloudera was something new. It will be a long slog for Cloudera to dig out of its valuation hole. Failure is common — even celebrated — in technology. But there’s a category of Cloudera-type companies no one wants to talk about that are neither crazy successes nor obvious flops. They were simply wildly overvalued in the startup-funding hot zone of 2014 to 2015, and they likely can’t sell or go public at anything close to earlier valuations. File-sharing startup Dropbox and its $10 billion valuation most likely falls in this category. It’s hard to justify Xiaomi’s $45 billion valuation. Indian e-commerce company Snapdeal may combine with a rival in a deal that could slash its valuation to $1 billion from about $7 billion. These are all good companies with real businesses. They are far from worthless, but they are worth less than they were a couple of years ago. The chief question about the unicorns in this camp is: Do their likely valuation discounts matter, either for these companies or for the broader appetite to own shares of young technology companies? There was an argument making the rounds that Cloudera’s valuation number was not real in the first place. Let’s kill that notion. If Cloudera’s valuation wasn’t real because it was set by an irrational actor, then no startup valuation is real. Also, try saying that to those Cloudera employees whose stock is now worth far less than they expected. Whether these overvalued unicorns matter beyond those companies’ executives, investors and employees is harder to gauge. There is plenty of fresh starup money to go around. The market for tech IPOs seems healthy, too. But technology investors can’t forget about the wreckage left behind at these startups whose valuations they pumped up to unsustainable levels. There are more moments of reckoning to come from the startup funding bubble of 2014 and 2015. This is a new kind of failure, and Silicon Valley hasn’t come to grips with it yet.